I Brake for Blue Bells! 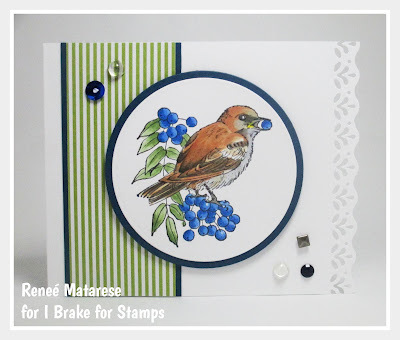 I Brake for Birds and Berries! 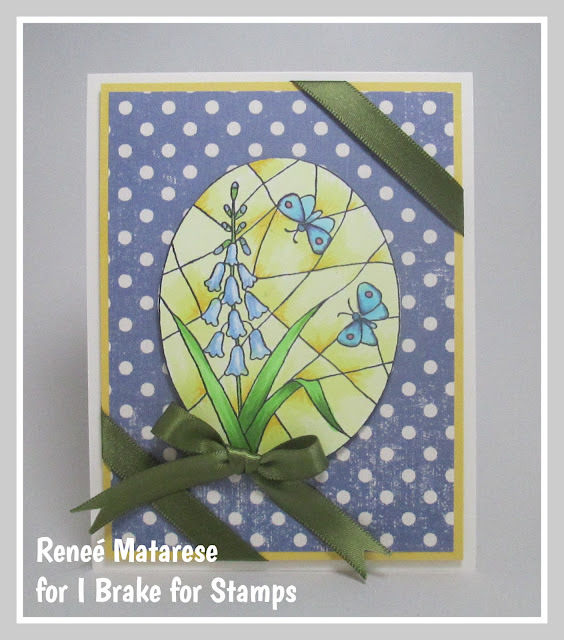 Today I'm sharing a sweet, Spring card with you. I used Tulip Basket Shy Bear. If you like this adorable little guy you can find all of the Shy Bears here. I originally intended to color the basket a tan color but I felt the white would be more spring-like. Hello from design team member, Heidi! 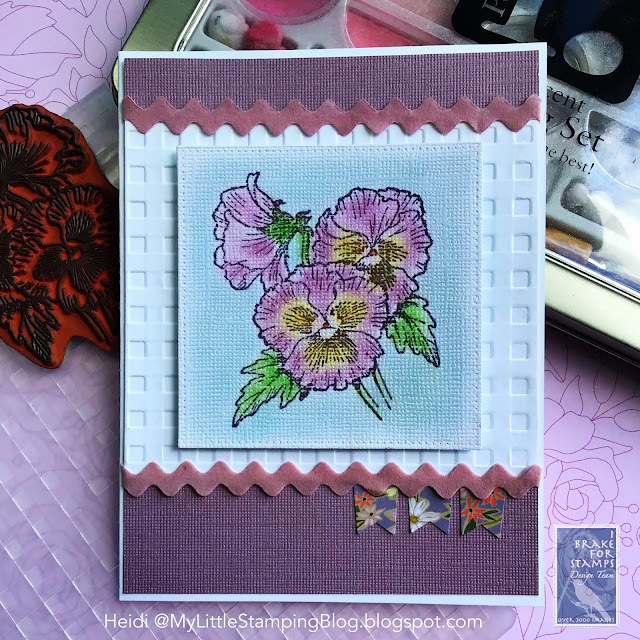 I have a pretty pansy card to share with you, which is right in season! I love these cheerful flowers for Spring and Fall, and all the wonderful colors they might be. This image was stamped in a dark purple ink onto some textured cardstock. 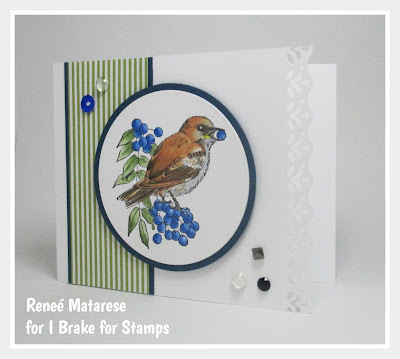 Now, textured card is not usually the best surface for stamping, but I knew I wanted to color this with chalks, and I like the extra interest it gives. Chalk is a wonderful coloring medium, it blends so well and is very fast to work with. It might be a good idea to seal your work when you use chalk. Since this is a card that will likely be displayed for just a few weeks, I just seal mine with a little aerosol hairspray. I thought these colors looked a little vintage, so I decorated my card with some velvet rick rack and scraps of pretty floral paper. 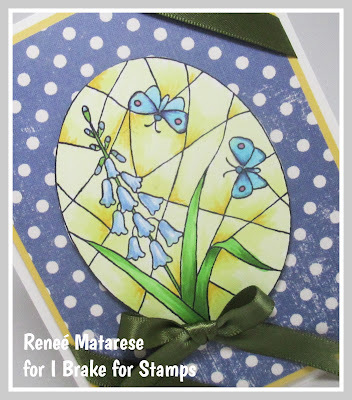 The stamp I used is called Three Pansies and can be found in the I Brake for Stamps Online store. 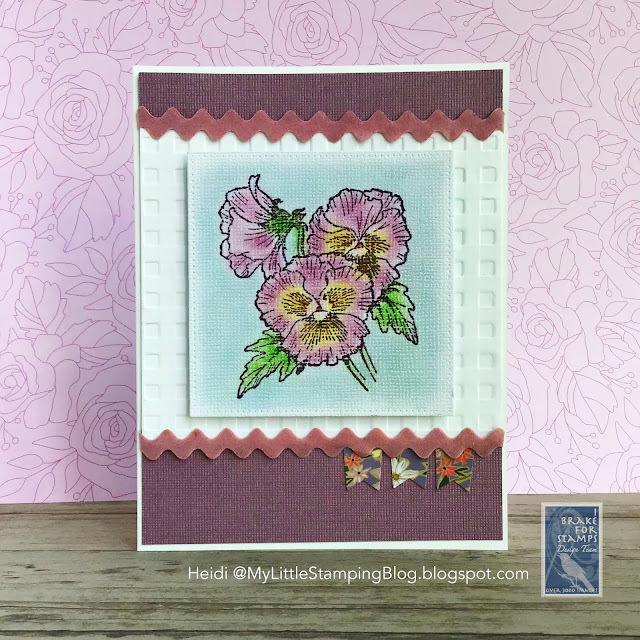 Today I'm sharing a floral stained glass card with you. 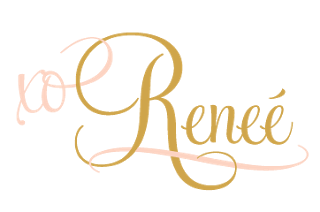 This stamp is on the full sheet called MS89 Full Plate. I'm not sure if I colored these flowers correctly. I'm thinking they're blue bells but I'm not sure. If they're not we're just going to call it artistic license! We have a butterfly in N.Y. called the Karner Blue. These butterflies don't really look like them but I chose blue to go with the flowers. Hello from design team member, Heidi! Today, I would like to share an Easter card. 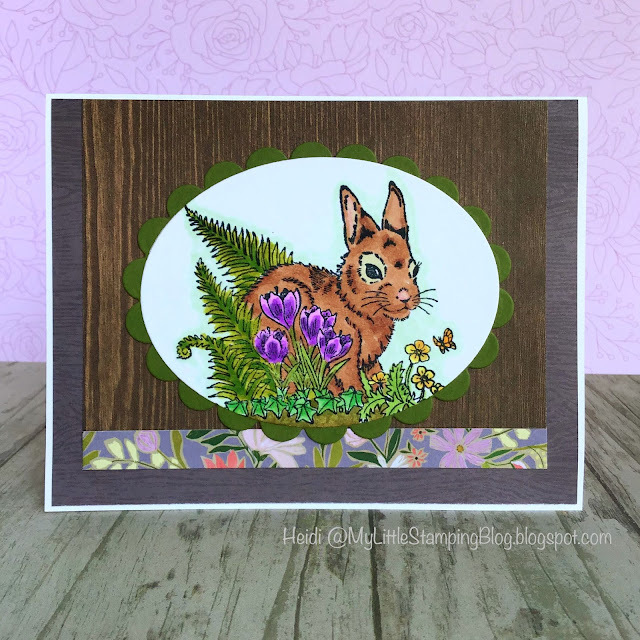 I colored the bunny image with some earthy tones, and cut it out with an oval die. I paired this with patterned papers from several different packs. I thought this was a lovely look for Easter, even if it isn’t the traditional pastel colors. 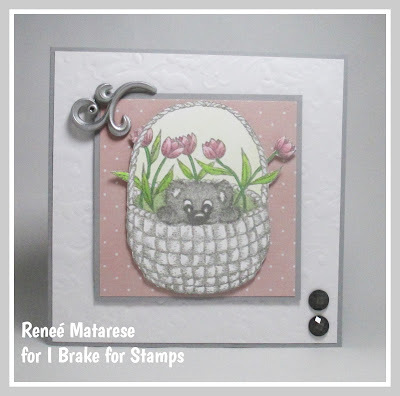 This stamp is called Wild Bunny and can be purchased in the I Brake for Stamps online store. They also carry a large number of other rabbit images. I have a friend that I've made cards for for years. She recently "re-purposed" one into a card for her dad. He said it just might be the prettiest card he'd ever seen. He recently lost his wife of over 60 yrs. so she asked if I could make some more bird cards that she could occasionally send to him. So...be prepared for more bird cards in my upcoming posts! This is the first one I've made. Sandy and her dad have a bond over their love of birds. If you look back through my bird posts you've probably heard me talk about her before. She bought me a bird feeder and some seed years ago, gave me a subscription to Birds and Blooms and I've never looked back. I have multiple feeders now and can identify every bird that comes to my feeders. 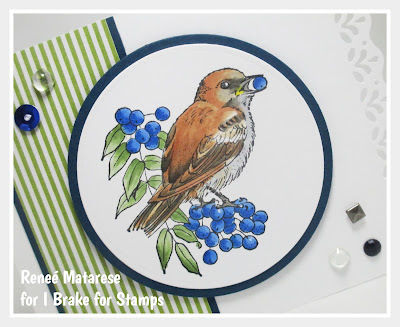 IBFS has an extensive collection of bird stamps. I Brake for.. Heart Tags! I Brake for Lovely Lady! I Brake for Iris Flowers!